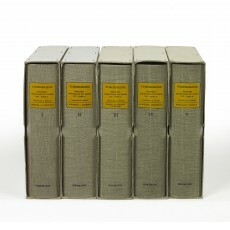 Five volumes (25.5 cm), I (Abbadie – G. Bouchet): (6) 953 pp. II (J. Bouchet – Diderot): (6) 978 pp. III (Dorat – La Mothe le Vayer): (6) 986 pp. IV (La Péruse – Montreux): (6) 958 pp. V (Morellet – Voiture): (6) 999 pp. Profusely illustrated throughout. Uniform publisher’s olive green cloth, original Mylar protective jackets; original plain card slipcases. 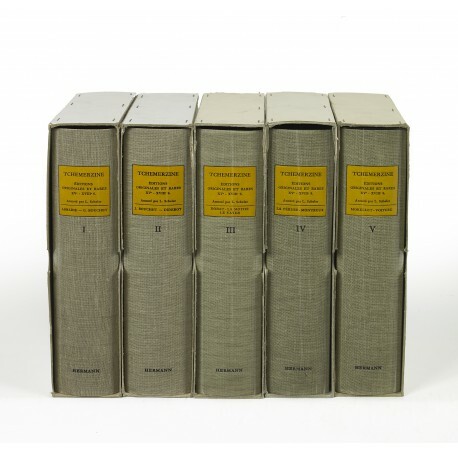 - Facsimile reproduction of the heavily annotated copy of the previous edition (in 10 volumes, published Paris 1927-1933) created by the doyen of the Parisian antiquarian book-trade Lucien Scheler (1902-1999). The author, Avenir Tchemerzine (Shamyrze), a Circassian Prince, arrived in Paris at the time of the Revolution; he is the father of the grande dame of French classical ballet, Ludmila Tchérina (1924-2004), and seems to have no other book to his credit. 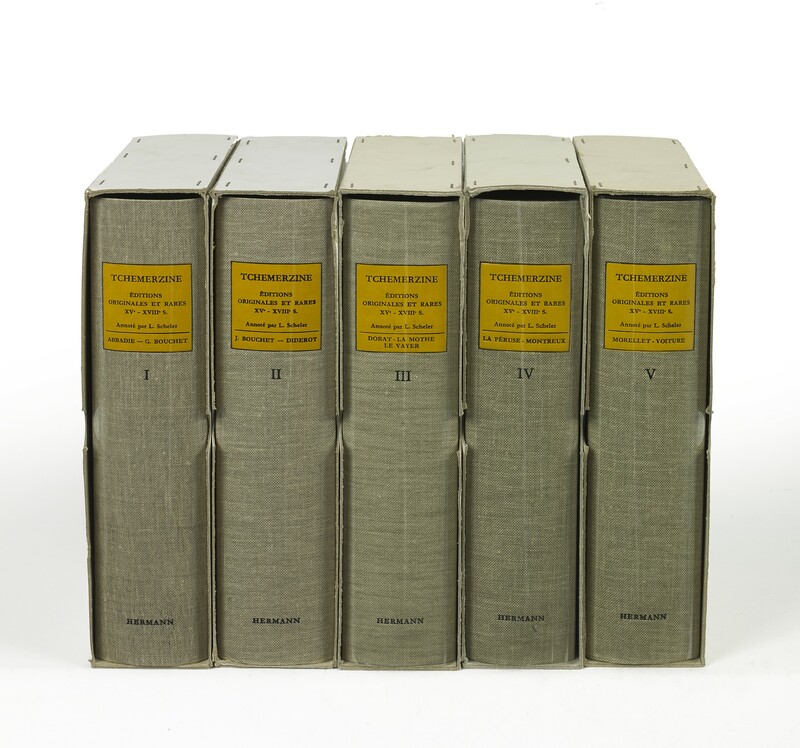 The bibliography claims to provide reproductions of over 6000 title-pages from works by 120 major French authors; the authors are listed alphabetically, their works appear in chronological order. Scheler’s manuscript notes mostly correct transcriptions or pagination statements, or record other editions. ¶ As new.